Ancient city of Bakirha in rural Idleb, UNESCO World Heritage Site. Source: DGAM. The DGAM have published photo assessments of damage to a number of mosques in Old Aleppo, see them here. 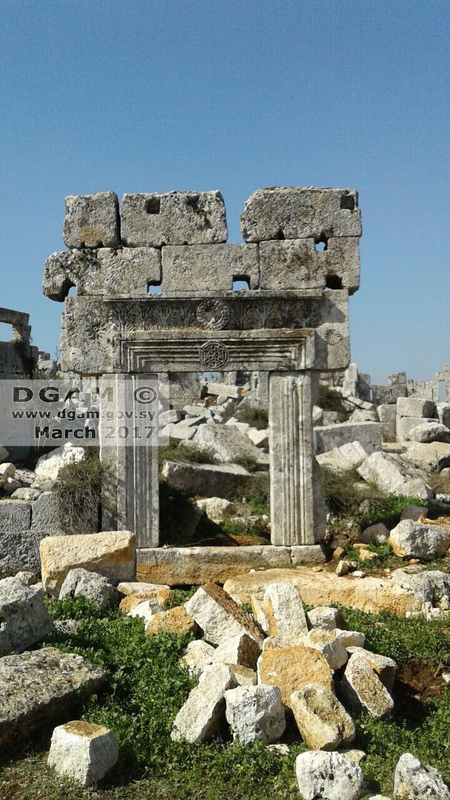 The DGAM have published photos of damage to the World Heritage site of Bakirha in the Jebel Barisha area of Idlib, which has suffered from stone robbing for construction and looting. The preliminary DGAM assessment of Palmyra is available here. Idleb Antiquities Center shared images showing the damage to Elba (Tell Mardikh), a Tentative World Heritage Site. The Idleb Antiquities Center also show their conservation work at the site here. The Authority of Tourism and Protection of Antiquities shared a documentary video showing the state of Tell Al Sabi Al Abyad, Al Jajiza canton. They also shared another one showing the state of Tell Teninir, Al Jajiza canton, here. The Tabqa Dam was hit in airstrikes against ISIS, who were reputedly sheltering in the dam. Unconfirmed reports suggest the dam is less structurally stable and many civilians have fled. If the dam collapses, the effect will be catastrophic. Read more on this story from NRT TV here and here. Newsweek has more information on the state of Raqqa, as does Reuters. Association for the Protection of Syrian Archaeology investigate the clandestine world of art and antiquities trafficking with filmmaker Tania Rakhmanova. “Art Trafficking – A Gray Market” is a documentary examining global art trafficking. Watch on the ARTE Sales website here. The Center Against Trafficking in Works of Art (Centar Protiv Krijumčarenja Umjetninama – CPKU ) work with looting and restitution after the Balkans War. They have produced guidelines for documenting works of art and reporting thefts, as well as providing detailed instructions on the best ways of photographing objects for documentation purposes (both downloadable from the CPKU website). Last year it published the first manual (also downloadable) on the illicit art trade in Bosnia-Herzegovina which incorporates information on the legal international and national legal framework, how art is trafficked across the country and the region, and suggested preventive measures, as well as reproducing the sample documentation instructions. This is available here. Eric Cline, Professor of Classics and Anthropology at the George Washington University, talks about the importance of heritage artifacts and the complexities of deciding ownership. Read an excerpt at the American Schools of Oriental Research blog. Emma Loosley has published an article on the value of archaeology to religious minorities, available here. The DGAM has published a progress update on the digitization of its records. So far, 3227 documents from 10 governorates have been digitized. This year it is planned to complete the documents for Deir ez-Zor, Raqqa, and Hasaka provinces. After the developments and advanced steps taken by the Al-Jazira Tourism and Antiquities Protection Authority and the expansion of the work at the district level and after the Commission held a series of meetings on 2017/3/27. The Authority of Tourism and Protection of Antiquities held a meeting with the Office of Relations of Women Protection Units (YPJ) The meeting discussed the issues related to the protection of archaeological sites in the province and the strengthening of relations with international bodies. Also it discussed the delegations through the Office of Relations for Women Protection Units (YPJ), thus conveying the voice and activities of the Tourism and Antiquities Protection Authority to international forums. Read more on this here. Minister of Culture Mohammad al-Ahmad will “spare no effort to restore brightness to the archaeological city of Palmyra in cooperation with the General Directorate of Antiquities and Museums (GDAM), UNESCO, the Agha Khan Network and all the organizations that are interested in protecting the Syrian and world heritage.” Read the full Syrian Times article here. The Aleppo Project are issuing an invitation to all Syrians living in Berlin to actively participate in the founding of a participatory planning system for the first time for the city of Aleppo. For more details see the event invitation on Facebook. The Masters and/or Doctoral Studentship in Maritime Archaeology – Honor Frost Foundation, University of Southampton, UK. The scholarship is primarily for study at MA/MSc level with the possibility of further funding for PhD, but may also be offered at PhD level if there are suitable candidates. This award is only available to students from Cyprus, Lebanon and Syria. More information can be found here. “The UN Security Council unanimously adopted Resolution 2347 for the protection of heritage. … Resolution 2347 is the first ever resolution adopted by the Security Council to focus on Cultural heritage.” Read more on the UNESCO website here. You can watch the UNESCO Director-General speak about Resolution 2347 on the UN WebTV site here. Find out more or download the publications in English, Arabic and French on the ICCROM website here. with a focus on how to cover heritage destruction. Read more on the UNESCO website, and download the publication there in English and French. The Council of the European Union has adopted a strategy on Syria, focusing on six areas and discussing heritage recovery in the future. You can read the full press release here. The “UN funding pulled from Syrian project to restore [the] Old City and bring residents back.” for the full story see here. The General Manager of Aga Khan Trust for Culture Mr. Luis Monreal, arrived on Wednesday 8, March 2017 for 2-day official visit in Damascus. On the first day, Mr. Monreal met the Director of the UNESCO Regional Office in Beirut, Mr. Hamed Al Hammami, the Syrian Trust for development, Aleppo Council City and DGAM. During this meeting the participants discussed the possibilities of cooperation and mobilization of national and international efforts through the recovery phase of the ancient city of Aleppo. Attendees discussed the need to form a steering committee to supervision of the preparation and implementation of the rehabilitation of the ancient city, directing workflow, implementation mechanisms in the different stages, coordination efforts and to secure funding from international interested parties. In the 2nd day Mr. Monreal met the Director General Prof. Dr. Abulkarim with the DGAM team, the meeting focused on way to enhance cooperation in the field of capacity building under the title of “Palmyra Museum Project”, as this cooperation will allow the training of DGAM staff in Damascus, the possibility of establishing a training laboratory and to send experts in different experiences in order to strengthen the national capacities in the field of restoration of the Palmyra Museum, expanded it through a new museum and dealing with the museum according to the latest internationally standards. Read more about this from the DGAM website. The BBC writes on the new tech (a form of invisible ink that is extremely difficult to remove but shows under UV light) being used to save heritage in Syria. NPR tests the new ‘data water’ process. Michal Lukeš, Director-General of the Czech National Museum, has announced that the museum will help rehabilitate some Syrian monuments, including in Palmyra. Read more from the Syria Times website here. UNESCO Chair Programme on Cultural Heritage and Risk Management, International Training Course (ITC) on Disaster Risk Management of Cultural Heritage 2017, Ritsumeikan University. “The 12th International Training Course will give special focus on the Integrated Protection of Immovable and Movable Cultural Heritage from Disasters.” For more information see here. “The reconstruction of war-torn Syria will be the focus on Wednesday (5 April) of an international conference hosted by the European Union in Brussels. The conference, which will be attended by more than 70 countries and organisations, will also focus on taking stock of humanitarian commitments pledged during a 2016 donor’s conference in London, seeking additional pledges and boosting support for a political solution under UN auspices.” (Read more at Qantara.de here). With Dr Zaki Aslan, Director of ICCROM-ATHAR, and Syria’s Director General for Antiquities and Museums, Prof. Maamoun Abdulkarim (via video). May 16 at the Royal Geographical Society, London. Learn more and buy tickets on the WMF event page here. The Atassi Foundation is an independent non-profit initiative, established by Sadek and Mouna Atassi with the aim of preserving, protecting and promoting Syrian visual arts heritage. It fulfills this goal by organising exhibitions of its extensive collection of Syrian art; fostering inter-cultural exchange by loaning artworks to leading international arts and culture institutions, arranging residencies, seminars and conferences for Syrian artists, curators and researchers; supporting research and publications on Syrian art and culture; and acquiring works by young Syrian artists. Read the Gulf News article here. a new exhibition that opened at the Penn Museum, America (8 April-26 November). It presents more than 50 artefacts from the museum’s collection, including a funerary relief from Palmyra (1st-2nd century CE), a 16th-century glazed terracotta tile from Damascus and Arabic illustrated manuscripts on complex mathematics, music theory and astronomy. Many of the objects were originally excavated from areas that have been torn apart by the Syrian civil war. Curators have installed newly commissioned works by the Syrian-born artist Issam Kourbaj throughout the show, including an installation inspired by 5th-century Syrian boats. Documentation of the Penn Cultural Heritage Center’s recent preservation efforts is also on view. The centre has proactively documented collections in northern Iraq and helped fortify 1,600 sq. ft of Roman and Byzantine mosaics at a museum south of Aleppo. Read more in the Art Newspaper. Read more in the TRT World article here. DW video about the heritage, but also the humanitarian situation, in Aleppo here. Al Jazeera investigates art trafficking. Watch the video and read more at the Al Jazeera website here. Deborah Lehr from the Antiquities Coalition discusses the new UNESCO resolution and lays out further action. Read more at the Huffington Post article here. The Irish Times interview Mamoun Abdul Karim about Aleppo here. News.com.au has a series of photos showing the damage in Syria, comparing before and after pictures here. TRT World interviews residents of Palymra about the future of the city. Watch the video here. There have also been a large number of reports covering the new invisible documentation method for objects, not covered here.